September 11, 2001 and for the first time ever all American airspace is closed due to the horrific happenings of that day. Planes from all over the world were diverted and 38 of those planes ended up landing in a little-used airport in a place called Gander Newfoundland. Over a few days 7000 were taken in by an extraordinary community, who with no warning opened their hearts and gave everything they had to help. Now imagine turning all of this into a Broadway musical. You’d probably think it mad just as I did when I first heard a plot outline, but what Irene Sankoff and David Hein have created is a piece that has incredible heart and is one of the most compelling new musicals I have heard of late. I have not seen the show and know little about how the show is staged so I am working purely from listening to this extraordinary cast album. The theatricality of tracks including 28 Hours / Wherever We Are, Darkness and Trees, On the Bus and Phoning Home are evident and have me wanting to see the show. This true story is told from the point of view of the locals of Gander and from that of the stranded travellers. Characters are vividly bought to life and the emotion associated with this extraordinary meeting of human beings permeates throughout. The score’s pace ebbs and flows as events develop and the lives of this group of people change forever. To highlight any particular performance from this recording is impossible. 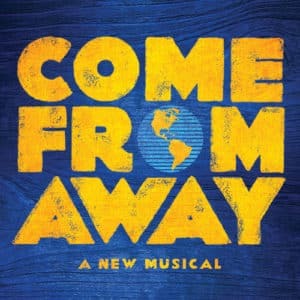 Come From Away is performed by an ensemble of actors of the highest calibre. Having written this review I am about to go and find out more about this story. Get a copy of this recording, clear some time from your day and listen from start to finish. I dare you not to be moved!